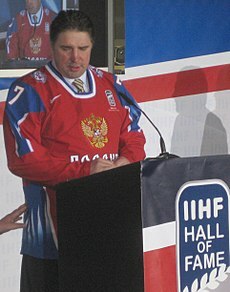 Alexei Viktorovich Kasatonov (Russian: Алексей Викторович Касатонов; born 14 October 1959 in Leningrad, Soviet Union) is a Russian former ice hockey defenceman, who was a long-time member of the Soviet Union national ice hockey teamand a member of the legendary "Russian Five" line. On the international stage, Kasatonov won two Olympic gold medals, in 1984 and 1988, and silver in 1980. He won an additional five gold medals at the World Championships in 1981, 1982, 1983, 1986 and 1989. On the club level, Kasatonov played for SKA Leningrad, CSKA Moscow, New Jersey Devils, Mighty Ducks of Anaheim, St. Louis Blues, and Boston Bruins. He was Anaheim's lone representative in the 1994 National Hockey League All-Star Game. Following a shoulder injury in an American Hockey League (AHL) game for the Providence Bruins in 1996, Kasatonov retired from the NHL and returned to play one last season for his former CSKA Moscow. The severity of the injury led Kasatonov to end his playing career, and he returned to New Jersey to settle down with his wife and son. In 1998 Kasatonov was the general manager of the Russian Olympic Team that captured the silver medal in Nagano. After the Olympics he began training his son, and soon began coaching youth hockey in the [[New York metropolitan area|Tri-State area], running his own weekly clinics in Staten Island for seven years. In 2003 Kasatonov founded the Admirals Hockey Club, which at its peak had five teams ranging from Squirts to Juniors. In 2004 Kasatonov accepted the head coaching position at Columbia University. In 2008 Kasatonov returned to Russia for a head coaching position at PHC Krylya Sovetov. In 2010 Kasatonov was the vice president of CSKA Moscow. In 2011–12, Kasatonov became the vice president and general manager of SKA St. Petersburg - formerly SKA Leningrad - of the Kontinental Hockey League, the first club that he played for in the Soviet Union. ^ Robinson, Joshua (14 October 2004). "Club Hockey Adds Former Soviet Legend Kasatonov as Coach". Columbia University. Archived from the original on 5 March 2005. Retrieved 10 February 2019.